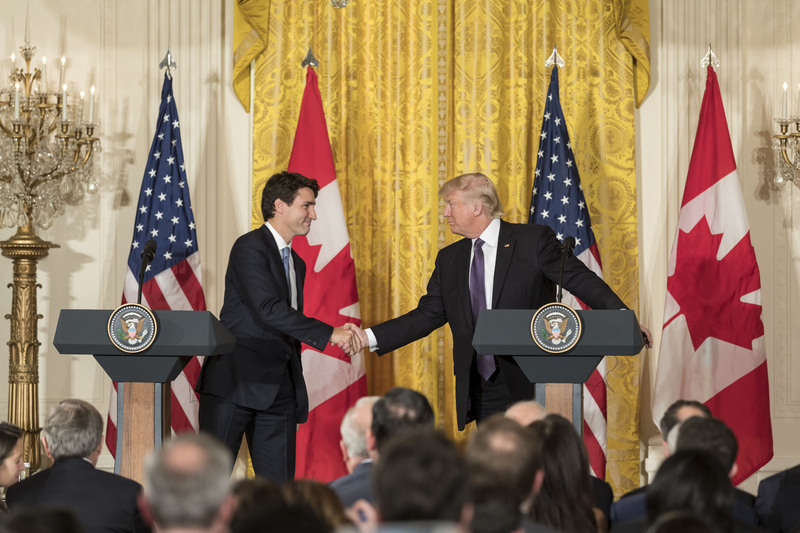 In the context of these still-tense U.S.-Canada relationship, the Canadian government must now consider whether it ought to continue pursuing trade diversification as fervently as before the new deal was reached. Canada had made attempts in the past to scale back its reliance on the United States market, and now these most recent negotiations have proven to Canadians that the relationship with their southern neighbour is not as reliable as it once was. Had Trump’s threat to leave Canada out of the North-American trade deal really come to fruition, Canada could have – unlike any other time since NAFTA’s inception – looked to non-U.S. markets for low-barrier trade alternatives. Even now that the USMCA (United States Mexico Canada Agreement) has been signed, these options for trade outside of North America should continue to be aggressively pursued. 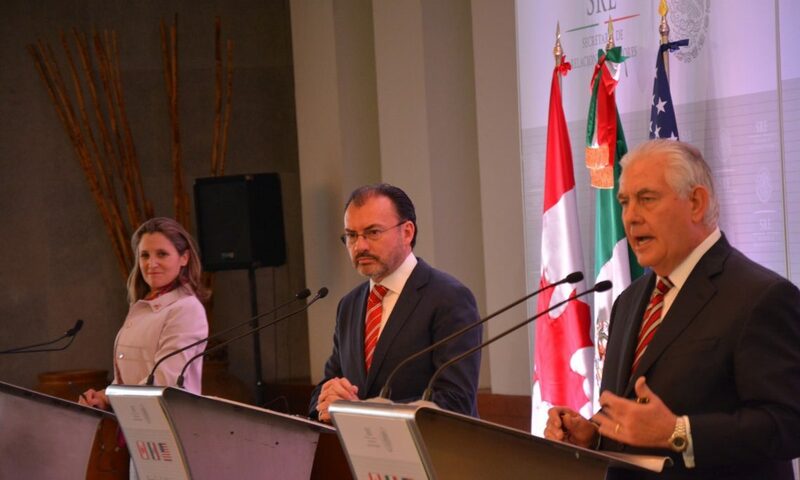 Canadian Minister of Foreign Affairs, Mexican Foreign Secretary Luis Videgaray, and former American Secretary of State Rex Tillerson at a joint press availability during the renegotiation of NAFTA. Canadian trade with the United States amounted to $673.1 billion in 2017. In a worst-case scenario where NAFTA had been terminated, resulting drops of $8.9 billion in exports, $8.8 billion in imports, and $3.3 billion in investments were expected in the first year. If these were most daunting prospects of a cancelled NAFTA, then there are numerous avenues for trade which Canada could have pursued to compensate. As Canada continues to redefine its relationship with the U.S., these options provide valuable opportunities for Canada to better position itself within the global trading arena. The first and potentially most fruitful option for trade diversification is through the Comprehensive Economic and Trade Agreement (CETA), struck between Canada and the European Union (EU). The deal is still only in its provisional application, and Canadian businesses have yet to fully tap CETA’s potential. Until all 28 members of the European Union ratify CETA, growth to Canada’s exports will remain limited (only 1% growth was recorded in the first year since its entry into force). While the exports side lags, the benefits for Canadian consumers have already materialized as 98% of tariffs on imports have been eliminated. This has allowed European goods to travel tariff-free into Canada, making many European products more competitive in Canadian markets, and providing consumers with lower prices and more choices. CETA is especially valuable because it reduces Canada’s dependence on the United States by offering such a major alternative for trade. A second intriguing supplement to USMCA is the Comprehensive and Progressive Agreement for Trans-Pacific Partnership (CPTPP). Once ratified, this agreement will give Canadian businesses access to large markets including Japan and Australia, as well as several in South America. Ratification should come easily in Canada, as both the government and opposition parties consider the CPTPP a priority. When the deal comes into force, it is expected to add another $4.2 billion to the country’s GDP. The multi-partisan support for ratifying the CPTPP confirms that Canada prioritizes diversification of trade and less dependence on U.S. markets. Prime Ministers Theresa May (UK) and Justin Trudeau (CAN) at a G7 summit in 2017. A third compelling area for Canadian trade expansion is the post-Brexit United Kingdom. Although still just an abstract idea, Justin Trudeau has already touted such an agreement as potentially “more impactful” than CETA, assuring that trade will continue seamlessly between the two countries after the UK leaves the EU. Even if next year’s election were to produce a new government in Ottawa, optimism about a Canada-UK free trade deal would likely persist: Conservative Party leader Andrew Scheer has already expressed his commitment to the idea. If the deal does eventually materialize, it would offer yet another chance for Canada to shift away from its strong reliance on the United States, which still accounts for three-quarters of Canadian exports. 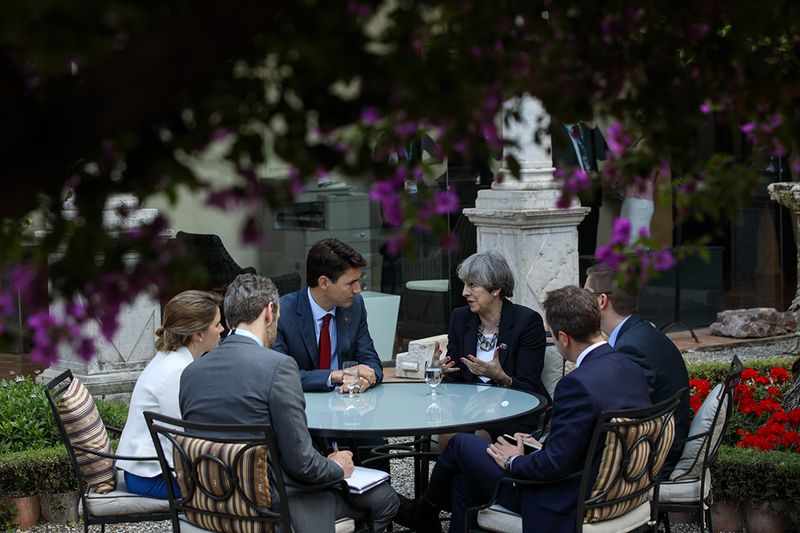 Implementation of a Canada-UK deal could even come sooner than ratification of CETA, considering the comparative simplicity of negotiating with just one other country as opposed to 28. As such, a modern trade deal with the UK could provide Canada with a quick opportunity for trade diversification, especially as Canada awaits the full benefits of its deal with the EU. No matter the ultimate ramifications of USMCA, Canadians can rest assured that prospects for trade exist with the EU, new Pacific partners, and the United Kingdom. These avenues provide increasing benefits for both Canadian consumers and negotiators, as Canada work to improve its standing in the global trading arena.